The Sidebar is a container that is used to hold your sidebar widgets. Not all Website Designs will use or come pre-loaded with a Sidebar, (ex: Odyssey, Waipio, Element etc) as the page layouts may not look good with a Sidebar added. However, you can add a sidebar to any Website design if you so choose. 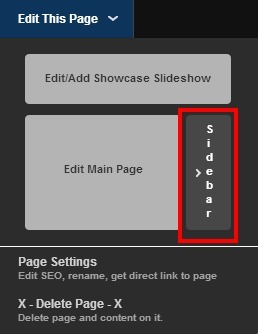 You have your choice of a Custom Sidebar which is a Sidebar you create to display widgets on one specific page, such as your Homepage, but you do not want to display the Sidebar on any other pages of your site. 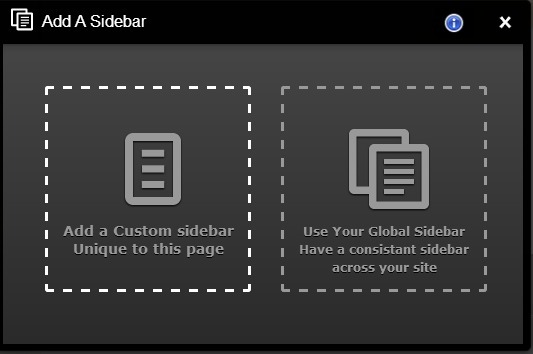 The Global Sidebar, allows you to create one Sidebar and enter in Widgets that you want to display on ALL pages of your site or ‘globally’.